Raking in Rs. 10 million since its launch on October 13, the northern-bound Yal Devi has become the highest revenue earner for the Railways Department, which now wants to put on more trains. About 10,000 people are using the train for day-to-day activities, earning the department Rs. 600,000 daily. Given the increase of passengers travelling to the north, the department has decided to launch a second night mail train as well as local train services between Jaffna and Kilinochchi, said Sri Lanka Railways General Manager V. Amaratunga. e have decided to start a weekend service from December,” he said. Mr. Amaratunga said people preferred to use the train over other modes of transport because of comfort, affordability and time-saving. The department expects to launch the train services up to Kankesanturai (KKS) by the end of this year. Jaffna Private Bus Association President P. Kengatharan said, since the train services began and CTB ran the Jaffna-Colombo route, private bus services have suffered. “Because of the cheap tickets and because they are easy to access, people go for train services. 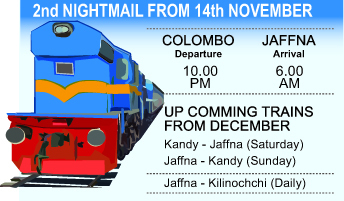 Now a third class train ticket to Colombo is Rs. 350 whereas private buses charge Rs. 800 because we have to pay Rs. 58,000 in monthly permit fees to the National Transport Board (NTB) every month,” he said. The NTB charges monthly fees of Rs. 58,000 for semi-luxury buses and Rs. 90,000 for air-conditioned buses. Mr. Kengatharan pointed out that private bus owners also had to pay Rs. 1,100,000 for an AC bus route permit and Rs. 700,000 for semi-luxury bus permits. T. Thevarasa, 38, who has been operating Jaffna- Colombo services with his two buses, said it had become very difficult to keep business profitable since the launch of the Yal Devi. 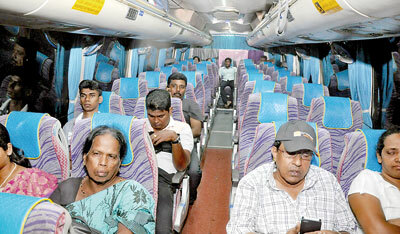 “Initially 30 buses were engaged on the Jaffna route and now only 13 are operating,” he said. “There are four train services daily and five on the weekend, and 80 CTB buses are operating from the depots in the Jaffna District to Colombo – so how can we operate our bus services?” he asked. On October 13, the Yal Devi was re-launched by President Mahinda Rajapaksa. The railway tracks were renovated and reconstructed by India’s state-owned IRCON International at a cost of Rs. 58 billion. India’s state-owned IRCON International conducted a successful test run last week on the reconstructed Madhu-Thiruketheeswaram railway track as more work continues on the Northern Railway Line Project. “It would take two more months to connect the link with Talaimannar. After that, a ferry service between Talaimannar and Rameswaram would be accessible to anyone from any part of the country,” said IRCON Executive Director S.L. Gupta. The Madhu-Thiruketheeswaram track, 26km in length, was totally reconstructed at a cost ofUS$150 million (Rs. 19,500,000,000). IRCON also built the Thiruketheeswaram Station. “The reconstructed railway track is designed for a maximum speed of 120 kph. The tracks are being built using the latest technology which will enable the passengers to have a smooth and comfortable ride,” said Mr. Gupta. The remaining sections of the Northern Railway line – Jaffna-Kankesanthurai and Thiruketheeswaram-Talaimannar – are now being completed, he said.